Safflower (Carthamus tinctorius L.) is a crop once grown for its dye now is grown for its oil in parts of Canada and the United States (50 percent of U.S. acreage is in California). Safflower is drought resistant and can be planted in irrigated and dryland areas as long as soils are well drained. Cool, wet soils delay uniform emergence, and periods of heavy rain can increase disease levels and reduce yields. The crop competes poorly with weeds, especially during early growth; timely use of herbicides is critical. Safflower is susceptible to many of the same diseases as the other oilseed crops, so rotations including these crops must be carefully considered. Safflower also has been reported to extract moisture from deep in the soil, reducing yields for crops following safflower in rotation; these effects, however, have not been well documented. Safflower meal (extracted using the hexane process, which yields more oil) has about 24 percent protein with hulls and 40 percent without hulls. Trials of dryland fallow safflower in Montana yielded 37 to 42 percent seed oil content and about 1,600 pounds/acre of seed as a 3-year average. Safflower is a common food oil, and the meal can be fed readily to livestock. Oil composition is similar to that of other vegetable oils such as soy and sunflower, and biodiesel from safflower is expected to have properties similar to soy biodiesel’s. Safflower – Potential as a Biofuel – Colorado State University Extension. Economics of Oilseed Crops and Their Biodiesel Potential in Oregon’s Willamette Valley, Oregon State University Extension Special Report 1081. Safflower in California – UC Davis; The Paulden F. Knowles personal history of plant exploration and research on evolution, genetics, and breeding. Sample Costs To Produce Safflower – University of California Cooperative Extension, SA-SV-11. Safflower Production – Collection of resources by Purdue University. Growing Safflower in Nebraska – University of Nebraska-Lincoln Extension. Safflower Publications – Safflower Production  – North Dakota State University Extension. 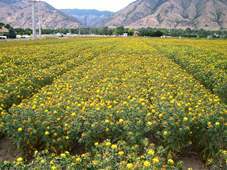 Safflower Variety Trials – Utah State University. Excerpted with permission from Economics of Oilseed Crops and Their Biodiesel Potential in Oregon’s Willamette Valley by William K. Jaeger, professor; and Ryan Siegel, graduate student; Department of Agricultural and Resource Economics, Oregon State University.